Because you are a valued patient at our clinic, we care about your opinion, observation about our practice and the service that you receive. Please take a moment to share your experience with us. “My husband brought me to see Dr. Vu. I agree with my husband’s experience at the clinic. It was an easy transition. He referred me to an OB/Gyn practitioner and made sure I got an appointment very quickly. One of my best experiences has been Dr, Vu’s accessibility, even for quick visits, especially when I get sick at work. I did not feel like going “through a ringer” when I call for consultation over the phone. I am really satisfied with the services. “I am one of the many relatives referred to Dr. Vu. I had been spending several months with my daughter in California. I try to see him when I am in Houston, and his office always accommodated me. I had a medical scare a few years ago which really made me appreciate Dr. Vu even more. I experienced sudden severe headache with nausea, vomiting, and a fainting spell. This happened during a car trip to Dallas with my family. I ended up in ICU at a local Dallas hospital, and had several tests and procedures, including a cardiac catheterization. When I finally came back to Houston, the symptoms persisted, although less intense. Dr. Vu did a thorough exam in his clinic. When he told me he wanted to do acupuncture, I agreed. At this point, I was willing to try anything that will relieve my headache, and I trust Dr. Vu. Besides, the acupuncturist staff was an experienced therapist. The procedure worked and my headache was completely gone. Dr. Vu made me a believer in eastern medicine after this. 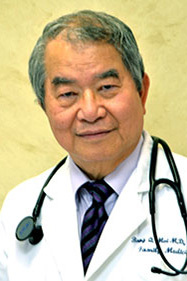 Dr. Vu,is an experienced and U.S. trained physician, who integrates his oriental background and experience, in his medical practice. This is rare and unique, and one of several reasons why I like going to his office. “I have a lot of allergies since I was a child, so I had been going to doctor’s offices and clinics. The worst experience I had growing up, was the waiting for hours to be actually seen by the doctor. This all changed when I came to Dr. Vu’s clinic. I am a busy man and I do not have a lot of time to wait. Being able to make appointments fast and easy is important to me. On top of that, I do not have to sit around in the waiting room for a long time. Dr. Vu spends time to explain to me what is going on with me and does not make me feel like I am wasting his time. I also like the staff because they are polite and helpful.